Arbit Blatas’ full-length portrait of Ms. Resnik in the title role of The Queen of Spades was a gift to the Met Opera, which in turn donated it to the National Museums of Lithuania in 2011. 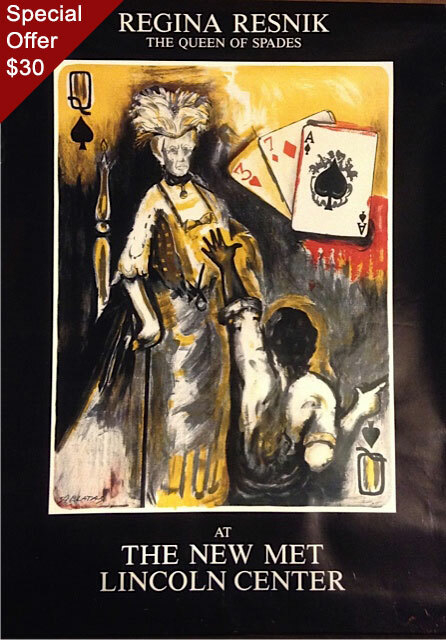 The poster captures her in this role, which she virtually owned at the Met in the 1960s and 1970s, with an imaginary young hero (or anti-hero) reaching for the secret of the cards! 34 5/8 x 24 in.